Apple has launched the latest version of its operating system for Macs, nicknamed Panther. 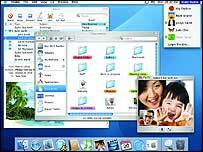 A desktop and server version of OS X version 10.3 was made available through Apple Stores on Friday. "We're delivering innovations today that will not be seen in any other operating system for years to come," said Apple's Philip Schiller. The £99 desktop version has 150 new features and a "revolutionary" interface design. Panther version 10.3 is the fourth software upgrade since Apple launched the OS X system in 2001. Apple says the upgrade will make document navigation and windows management much easier. The company is touting the re-design of its interface, Expose, which lets users to see all the windows which are open at once, as "revolutionary". There is also a new Finder that is supposed to give users an easier way to get to favourite files and folders. It has a sidebar which is similar to the navigation system used in iTunes. They are also hoping business users will be attracted to its iChatAV desktop video conferencing software. Panther also includes improved e-mail and spam-filtering. But the last version of OS X, nicknamed Jaguar, only came out in August 2002 and some Mac users may not be willing to upgrade again so soon. Apple are convinced Panther is a better upgrade and that the new features will appeal to a wide range of users. Those who bought a new Mac computer after 8 October will be able to buy the upgrade for £14.00. They are also offering a Family Pack for £159 which will license up to five computers per household. The Mac OS X operating system is created on its Unix-based Darwin core, which is a combination of its own open source code and elements from FreeBSD, Apache and Perl. The server version of Panther will be based the desktop version, but integrates open source software with management tools for Mac, Windows and Linux client server solutions. Apple estimate there are now more than 8.5 million people using its OS X system worldwide.